In the previous tutorial in this series on tone and color correction in Photoshop, we learned all about the Brightness/Contrast image adjustment and how it can quickly and easily improve the overall brightness and contrast of an image. Unlike the fully automatic Auto Tone, Auto Contrast and Auto Color commands that we looked at in the beginning of this series which offer no way to adjust or fine-tune the results after applying them, the Brightness/Contrast command gives us manual control over our settings with easy to use, independent Brightness and Contrast sliders. There's two ways that we can apply Photoshop's Brightness/Contrast command; one is as a static adjustment, the other is as an adjustment layer. We covered how to apply it as a static adjustment in the previous tutorial. The problem with static adjustments, though, is that they make permanent changes to the pixels in our image which makes it tough to go back and re-edit things later. This type of workflow is known as destructive editing and is something we should always try to avoid. A better way to work is by using non-destructive methods to accomplish the same things, and one of the best ways to do that is by taking advantage of adjustment layers. So in this tutorial, we'll learn how to easily apply the Brightness/Contrast command not as a static adjustment but as a flexible and fully-editable adjustment layer! Since I covered everything about how the Brightness/Contrast command works in the previous tutorial, I'll be moving a bit more quickly here so we can focus more on how to apply it as an adjustment layer. 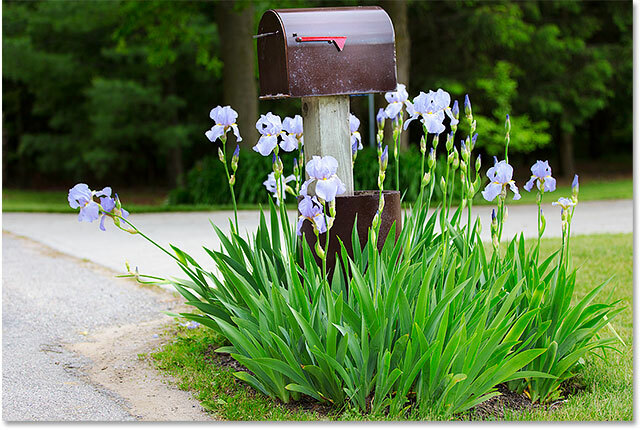 If you're not familiar with the Brightness/Contrast command, I highly recommend reading through our Applying A Brightness/Contrast Image Adjustment In Photoshop tutorial first before you continue. As with all tutorials in this series, I'm using Photoshop CC (Creative Cloud) but everything is fully compatible with Photoshop CS6 as well. Clicking the Brightness/Contrast icon in the Adjustments panel. Selecting the Adjustments panel from under the Window menu. Selecting a Brightness/Contrast adjustment layer. 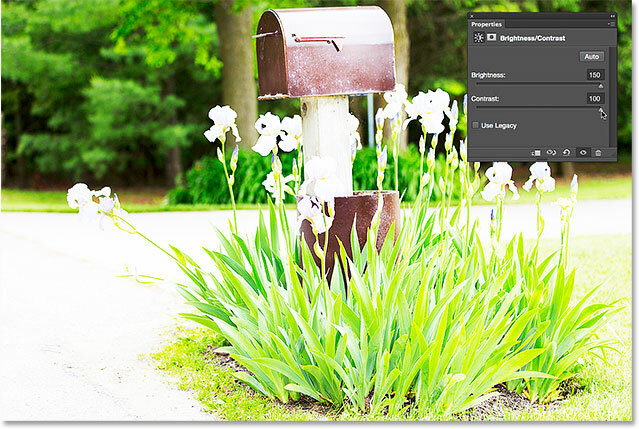 The Layers panel showing the Brightness/Contrast adjustment layer. The Brightness/Contrast options in the Properties panel. The Auto brightness and contrast settings that Photoshop came up with. The image after trying the Auto button. If you think your image could still look better after trying the Auto button, you can make further adjustments using the Brightness and Contrast sliders. Dragging a slider to the right increases brightness or contrast. Drag to the left to decrease brightness or contrast. A "before and after" comparison of the Brightness/Contrast adjustment. 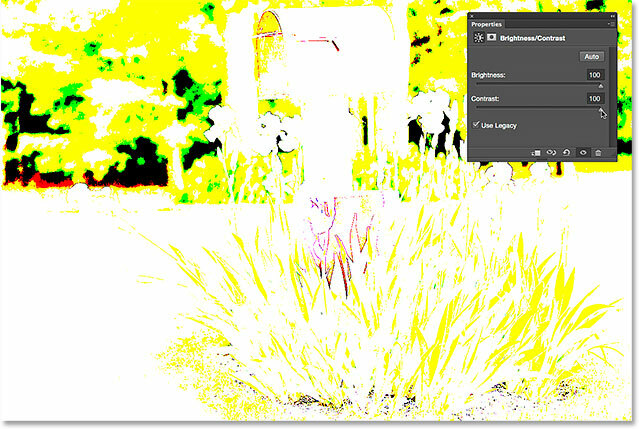 The image with Use Legacy on and both Brightness and Contrast set to their maximum values. The same increase in Brightness and Contrast but with Use Legacy off. Lowering Brightness and Contrast to their minimum values with use Legacy on. The same decrease in Brightness and Contrast but with Use Legacy off. 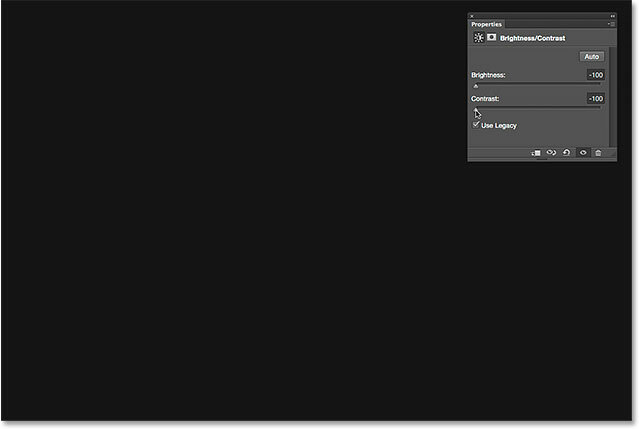 The layer visibility icon in the Properties panel. The same visibility icon in the Layers panel. The Reset icon restores the default values. 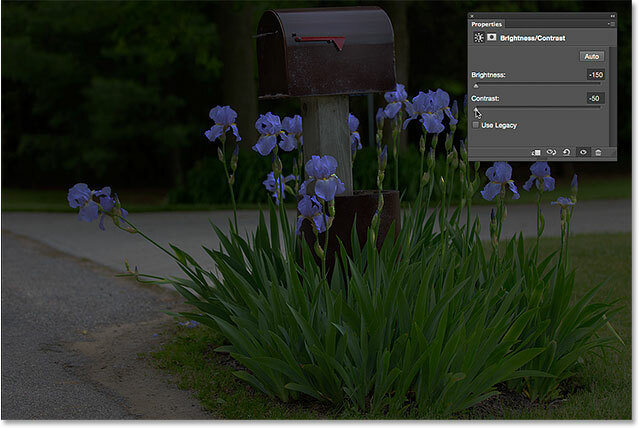 The Properties panel now shows options for the Vibrance adjustment, not Brightness/Contrast. Clicking the Brightness/Contrast thumbnail icon. The Properties panel shows the settings for whichever adjustment layer is currently selected. And there we have it! That's how to easily improve the overall brightness and contrast of an image, and keep your settings both fully editable and non-destructive, by applying Brightness/Contrast as an adjustment layer in Photoshop! In the next tutorial, we'll learn how to restore hidden detail in the shadows and highlights of an image with Photoshop's powerful Shadows/Highlights image adjustment!